Your students need clear, complete answers to their questions about research, writing, and grammar—and they often need them at a moment’s notice. As their teacher, you are their greatest resource, but you can’t be available 24/7. For help with work in class and at home and especially for questions at odd hours, students can turn to A Pocket Style Manual. The thoughtfully revised seventh edition makes it even easier for students to effectively and independently address their writing and research challenges. 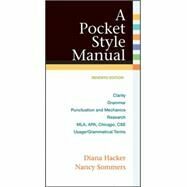 With 325 documentation models in four styles and coverage of drafting thesis statements, writing correctly and effectively, finding and evaluating sources, and writing research papers, A Pocket Style Manual supports writers across the disciplines. Our newest set of online materials, LaunchPad Solo, provides all the key tools and course-specific content that you need to teach your class. The LaunchPad Solo for A Pocket Style Manual includes exercises, sample student writing, and LearningCurve game-like adaptive quizzing. To package LaunchPad Solo free with A Pocket Style Manual, use ISBN 978-1-319-01282-3. Diana Hacker personally class-tested her handbooks with nearly four thousand students over thirty-five years at Prince George’s Community College in Maryland, where she was a member of the English faculty. Hacker handbooks, built on innovation and on a keen understanding of the challenges facing student writers, are the most widely adopted in America. Hacker handbooks, all published by Bedford/St. Martin’s, include The Bedford Handbook, Ninth Edition (2014); A Writer’s Reference, Eighth Edition (2015); Rules for Writers, Seventh Edition (2012); and A Pocket Style Manual, Seventh Edition (2015). Nancy Sommers, who has taught composition and directed composition programs for thirty years, now teaches writing and mentors new writing teachers at Harvard’s Graduate School of Education. She led Harvard’s Expository Writing Program for twenty years, directing the first-year writing program and establishing Harvard’s WAC program. A two-time Braddock Award winner, Sommers is well known for her research and publications on student writing. Her articles "Revision Strategies of Student and Experienced Writers" and "Responding to Student Writing" are two of the most widely read and anthologized articles in the field of composition. Her recent work involves a longitudinal study of college writing to understand the role writing plays in undergraduate education. Sommers is the lead author on Hacker handbooks, all published by Bedford/St. Martin’s, and is coauthor of Fields of Reading, Ninth Edition (2010). 7 Repair misplaced and dangling modifiers. 9 Find an appropriate voice. 10 Make subjects and verbs agree. 11 Be alert to other problems with verbs. 12 Use pronouns with care. 13 Use adjectives and adverbs appropriately. 16 Review grammar concerns for multilingual writers.